The world of motorsport has paid tribute to former World Rally champion Colin McRae, who has died along with his young son in a helicopter crash. David Richards, McRae's former boss at Subaru, said the 39-year-old Scot will be remembered for his winning attitude. "He had a competitive spirit like I've never seen in any other individual in my life," said Richards. "He was one of those people who had an extraordinary spirit that you just can't define. It's a terrible loss." Official confirmation of his McRae's death came at 1255 BST on Sunday. His agent, Jean-Eric Freudiger, also confirmed McRae was piloting the helicopter when it crashed, killing all four people on board, including McRae's five-year-old son, Johnny. McRae, 39, the son of five-times British rally champion Jimmy, wrote his name in the record books in 1995 when he became the first Briton to win the World Rally Championship. Richards insisted it was his fearless and at times gung-ho approach that won him many admirers in the sport and fans outside it. "That was his style. He had a real have-a-go instinct," said Richards. "It was a special thing that you would never want to take that away from him. "You could throw any car at him in any recognised motorsport and he would do well. "I remember when I put him in a Formula One car at Silverstone and how great he was in that straight away. "It could have been a sports car, touring car, Paris-Dakar, you name it. It's unusual to call somebody a legend, but it's very appropriate for Colin." Nicky Grist, McRae's co-driver since 1997, said the whole of the rally world was in shock and said McRae was "such a great character". Speaking about his time with the former world champion, Grist said: "I have to say they were the best times of my life. "We used to drive to the max and push everything to the absolute limit. But when it came to socialising we had great fun also." Grist added: "Colin was always regarded as being a bit of a risk-taker in cars, but when it came to flying a helicopter he was a totally different man. Fellow Scot and Formula One ace David Coulthard said McRae was both "fearless" and "flamboyant". "He and Alison were good friends and I cannot imagine either without the other," said Coulthard, who was due to partner McRae in Team Scotland for the latest version of the Race of Champions at Wembley Stadium in December. "He was fearless, flamboyant, blindingly quick in the car. He was very down-to-earth, matter-of-fact that he was so good. He had all the good Scottish traits. "I competed in the Race of Champions with him because of my respect for him. I remember him urging me on, telling to get the finger out for Scotland. "We had some great times and his passing is a terrible blow for the McRae family and everyone who came in contact with him." Sir Jackie Stewart also spoke of his sadness at McRae's death. "We want to extend our sincere condolences and deepest sympathy to Ali, Jimmy and the rest of the McRae family," said the three-time Formula One World Champion. "It's a sad loss for Scotland, of a real hero and an immensely popular friend. "He really was a driver that spectators loved because the car was always moving. "He just conducted his driving in a way which was so confident, so full of enthusiasm and spirit." Max Mosley, the president of FIA, motorsport's governing body, said: "It's tragic that he should die like this when he's retired from the dangerous part of his career. "I don't think anybody disliked him, everyone was his friend in the sport. "Some of his achievements in rallying were absolutely extraordinary. Everywhere he went he was an ambassador, an ambassador for the sport and for Scotland, he was terrific." Motorbikes legend Valentino Rossi dedicated his win in Sunday's Portuguese MotoGP to McRae. "He was one of my idols when I was young. He was the Kevin Schwantz (US Grand Prix rider of 1990s) of motor rallies," said the Italian. "It is a very sad day for motor sports but I'm happy to have been able to win for him today." 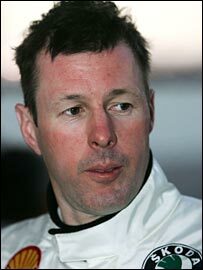 Martin Whittaker was Colin McRae's team boss at Ford and is now the chief executive officer of the Bahrain F1 circuit. He told BBC Sport that McRae was an immensely influential driver, adding: "First of all, his personality was extraordinary. "But I think it was his driving, his flamboyancy. It was gritty, it was gutsy and his determination was better than anything I'd ever seen. "He had that attitude which was sort of 'press on regardless'. He was spectacular, he had lots of accidents, but at the same time he was the youngest world champion. "He delighted many hundreds of thousands of rally fans and of course he endeared himself to millions around the world. "He brought the sport from something that was perhaps not so well known and became a household name." Malcolm Wilson, BP-Ford World Rally Team director, added: "I was privileged to have Colin in our team driving for Ford at a time when he was at the peak of his powers. "He achieved one of his greatest victories with us when he won the legendary Safari Rally in Kenya in 1999 on only our third event with a brand new Focus WRC. "It was a victory he went on to repeat in 2002. "Since retiring as a full-time driver in the WRC, Colin has done much for the sport at grass roots level and his tragic death is a huge loss to British sport in general." Renault F1 driver Heikki Kovalainen told BBC Sport he admired McRae's driving skills and winning attitude. "His driving style and his way of even living was what captured people's imagination," said the Finn. "He was really daring, always pushing it further. "I always liked his attitude. It was maximum attack always and he had some big rolls sometimes. Every time he had one, though, it was like: 'Oh well, it's just a roll', and he just carried on. "That's what people will remember and that's why he captured so much attention. He was a real character, a real racer. "It goes beyond racing. 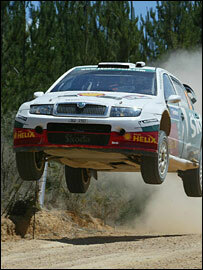 I think he is the most well-known rally driver in the whole world because of his big accidents, or his attitude. "The first time I met him was the Rally Finland in 1995, when he rolled his Subaru twice. I went to ask for his autograph, and I still have it." Ex-Formula One driver Martin Brundle, who swapped racing cars with McRae in a publicity stunt in 1996, said: "He was a naturally gifted driver, whatever he was in. "I've always thought rally drivers are probably the most all-round skilled drivers in the world because of the conditions they have to cope with. Having done a couple of rallies, I know what an extraordinary challenge it is. "He was fearless, and as David Coulthard said, one of the good guys. Why is it always the good guys it happens to? "He had a cult following because he was always exciting to watch. "When he drove the F1 car, he just picked it up by the scruff of the neck and gave it a thrashing." Colin Hilton, chief executive of the Motor Sports Association, said McRae was an "inspiration to all who knew him and to millions around the world". He added: "His energy, commitment and extraordinary talent brought him domestic and international success, while his uncompromising style and determination made him the hero of fans everywhere. "Throughout a glorious career, that saw him rise from the grassroots of the sport to the pinnacle of the world stage, Colin was always a great ambassador for Scottish and UK motor sport. "Since retiring from the WRC, he has continued to dedicate himself to the sport, in particular the development of the next generation of rally drivers and co-drivers."